Q: How can I tell it my tank has ice formation? A good way to tell if your tank has ice formation is by investigating the condition of the tank’s walls – scraping, abrasion in the concrete or denting of the tank hardware and ladders suggests that ice has formed inside your tank. You can also install submersible temperature probes which work underwater and are battery operated. The probes can be submerged at various depths in the tank and if you have any thermal stratification in the winter, it would suggest that you’re likely to have ice formation. Q: Why are standpipes harder to keep ice free? The challenge with standpipes is that they are tall and skinny, just like the water heater in your house. This tall and skinny geometry causes water at its freezing point to float to the top. The momentum of the water coming from the inlet at the bottom of the tank is so far away that it doesn’t influence the top of the tank. 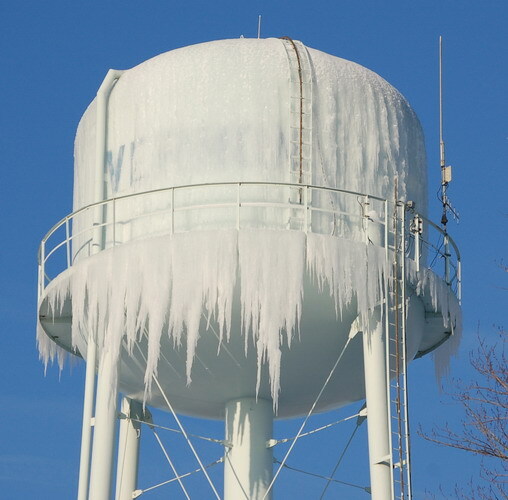 This makes standpipes prone thermal stratification and to ice formation. Q: Do buried tanks experience ice formation? In general, buried tanks are better insulated than above ground storage tanks. However, we have still found places where underground tanks develop ice after only a few winter days.